My other thought is I have a 10x and 30x stereo microscope that covers low power. So I don't probably need to worry as much on a lower power. It's a shame the scope wasn't properly outfitted to start with. But I do like it. This is always the problem with used microscopes - some are uncomplete, some have defects, some just need maintenance and some are not right for the buyer's needs. On the other hand side you get a quality instrument for a modest sum and of stable value. A compound microscope is mostly used between 100x and 600x total magnification. Here is a rare case where I used a 1,6:1 or 2,5:1 objective: http://www.microbehunter.com/microscopy-forum/viewtopic.php?f=6&t=7013 but look at the diameter of the leaf! So you won't have real problems with your microscope. The additional magnification of your 2x lens doesn't give more detail, but it makes seeing the available detail easier. This was probably the original idea behind the 2x lens. A stereo microscope is very valuable addition. It doesn't offer great photo qualities (too low n.a. for this) but it offers 3D-viewing and very easy handling. My 7 year old really enjoys it. Don't worry, microscope technique is a wide and difficult field, but you don't have to be an expert to start working with the microscope. Your lamp base probably had a lamp socket when new, that places the filament in the right spot. They tend to get lost when power supply and microscope are separated. For perfect function this is necessary, but as long as you get a fairly good image I would worry later. These bulbs run quite hot, so make sure it doesn't fall out while switched on. Do you already have a topic in sight that you want to study? I think collecting some pond water would be fun. Or collecting some moss from the forest we have near by. I would also like to gather some sand from different places and check it out. And maybe look for meteorites in my gutter. I have a 10 year old, a 7 year old, and (oops) a 1 year old. So far the older kids have really enjoyed looking through it. So I think getting them involved in the whole process will be fun. Collecting samples from our hikes and then looking at them under the microscope. I picked up a kit to make my own slides and a good amount of prepared slides. All of this actually started when I got a meteorite from my daughter for Christmas. I wanted to check it out closer and got a stereo microscope (which turned out better than I expected). Then I decided I wanted to get a compound microscope also. I sold many telescope eyepieces to fund the microscopes. Coincidentally to our discussion, those eyepieces ranged from 100 degrees FOV down to 43 degrees (quite narrow). It's OK though because I still have way more eyepieces than I would likely need. I'm one of the few telescope observers who still doesn't mind using narrow FOV eyepieces. But I usually use those for planets (where they do a better job in my opinion). That's the thing . Your microscope was clearly intended as a higher end stand but somewhere along the way the optics have been swapped out for more common optics. That condenser is a very fine condenser, capable of meeting the demands of any optics you might want to put in there. It might need to have the top lens unscrewed or an aux. lens installed under it( both techniques do pretty much the same thing), in order for it to fill the entire field with a low power objective though. 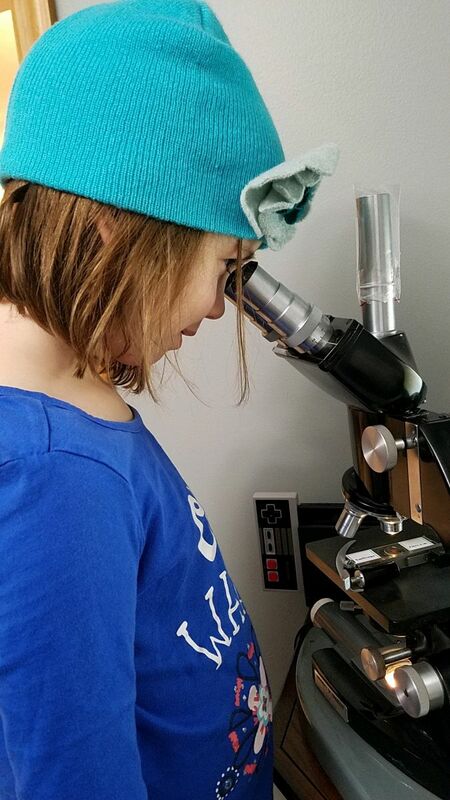 This is quite a good combination: You as an adult microscopy newbie and your children! If you are interested in micro meteorites there is now way around Jon Larsens book: https://www.amazon.com/Search-Stardust-Micrometeorites-Terrestrial-Imposters/dp/076035264X which is good for children too because there is not too much text but many pictures. Pond life has a very low concentration in free water. You find more on the surface of plants and pieces of wood or use a plancton net or - sieve to increase concentration. Using the plancton sieve: The best setup is to use piece of plastic HT-tube of 70mm diameter and ca. 90mm length. Cut it of halfway even. Then put the whole piece of mesh on top and weld it be heating the mesh. You can use a solder iron or even the kitchen oven. At first you weld single spots in diametral positions to fix the mesh on the tube. Then full weld the circumference. "Welding" here is just to heat the mesh to ca. 200 °C and press it into the plastic. A really nice setup consisty of a round plastic box with a lid that holds the plancton sieve, and inside the sieve you can store a urine sample bottle of water enriched with plancton. At the pond you just keep on pouring water with the box through the sieve until you have a nice concentration together. Always fill the sample bottle completely because otherwise the splashing insife will harm the plancton life. Keep it evenly temperated and realease it into a pond aquarium with some plants afterwards. This can be any jar with clear glass of 1 liter or more. 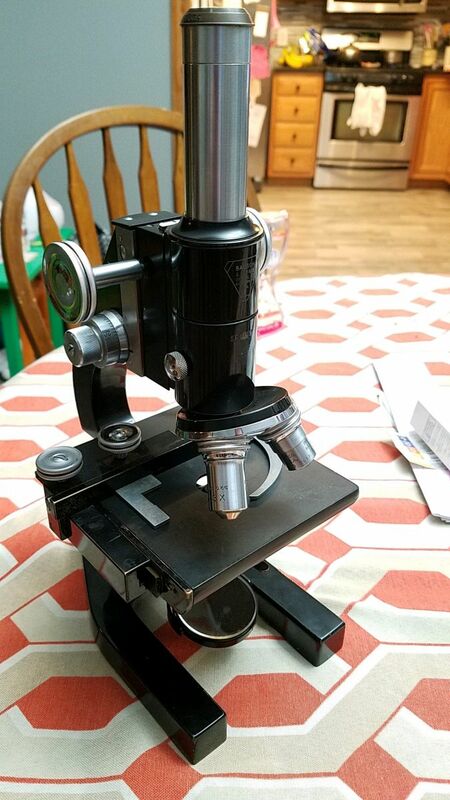 I ended up getting another microscope (a 1930s B&L) for cheap on ebay. I'll post about that one on some other threads eventually. It made me realize that the condenser was a bit of the issue with this microscope. Unscrewing the cap thing on the condenser and removing it helped with the image. I'm not sure why, but it does seem better. I used the simpler condenser from the new microscope...and it was what made me realize that the other condenser was not optimal. I also prefer the image when using a mirror with daylight to the Dickenson setup. I'll probably get some different lightbulbs from the store to see if it improves the image. I was thinking a soft bulb vice a clear one may work better. The new microscope came with a bunch of eyepieces....which included a pair of 5x ones. They are pretty tight FOV, but at least they are lower power to offset the 2x tele extender. Another good thing is I can use the 15x eyepiece with the new scope. It actually is quite nice with it. Does either of your B&L microscopes have the upper condenser lens buried in the stage? My binocular B&L is set up that way. Only the lower condenser lens moves up and down to focus. Some more photographs might help. The condenser on your trinocular, of which only the lower section can be seen in your photographs, looks like an advanced one that properly adjusted should give great images, at least with objectives of 10X or higher. If you want to use a mirror and light bulb, as I have for the binocular, a frosted one works best. I discovered if the bulb was mounted near the microscope, the 43X objective gave a washed out image with poor contrast. Closing the condenser iris helped, but closing it very much lowered the resolving power of the objective. I discovered that moving the frosted light bulb several feet away, enough so it didn't quite completely fill the field, contrast with the 43X objective improved a great deal, without having to excessively close the condenser iris. In doing this, the condenser was focused so the image of the frosted bulb was focused in the image plane while the objects on the slide were in focus also. This is a partial implementation of old fashioned critical illumination, where in the old days the condenser was adjusted so the image of the lamp flame was in focus while the objects on the slide were in focus. Not really related here, but I also discovered that the washed out, low contrast images produced by the 6L 45X objective on my antique Leitz microscope could be greatly improved using the same technique. But not knowing that at the time helped coax me to start buying more microscopes. I'll take some photos of the condensers when I get home from work. I'll need to get some sort of illuminator for the mirrored microscope. But I do like it so far. I had to do some work to get smoother movements. It's still not perfect, but it's quite useable. The Triocular has pretty smooth movements so that's nice. The top condenser is from the new older microscope. 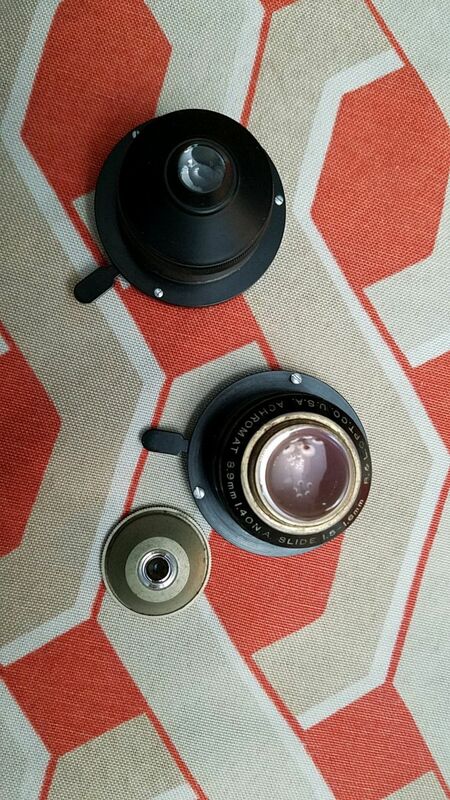 The bottom one is from the Triocular and it has a little piece that screws on top. One issue I have is, I was having trouble centering the condenser with the centering screws. I had to shim it to get it centered. I think it needs a spacer for the condenser holder. The top condenser looks like a standard 1.25 N.A. Abbe unit. The lower condenser is a valuable achromatic 1.4 N.A. unit, designed for a specific slide thickness. That much I can see engraved on it. It was designed for high power research work with apochromatic objectives. The upper lens is probably removable because the condenser may not be able to fill the field of view when using a 10X objective. It should work fine with the upper element removed for lower power objectives. If you want to get maximum performance with objectives 40X and above, the upper element should be screwed back on. By any chance, does the circular opening in the stage of your trinocular model have a lens embedded in it? If it does, then it's not surprising the condenser would not work well with the upper lens installed. If it doesn't, then your microscope should work fine with that condenser when using high power objectives. Any collectors here of vintage B&L research microscopes will drool when they see that condenser. OK...that makes sense since there is a 2x internal element...meaning everything is pretty high power. No lens in the stage. Last edited by GOLGO13 on Wed Feb 13, 2019 1:18 am, edited 1 time in total. Well...I tried to do some side by side comparisons and it seemed better without that cap. But, I probably should do some comparisons using the digital camera. See if it makes a difference with that. I believe my light source could be the culprit also. The guy I got it from fabricated the light. Not sure how the original Dickson was. Cannot find much on the web for it. I may want to get a mirror back on it. The nice aplanatic achromatic condenser is made for slides of 1,5 to 1,6 mm thickness. Todays slides have mostly 1,1mm. Apertures (here 1,4) over 1 can only be used effectively when the condenser is connected to the slide with a drop of immersion oil. This way you get homogenous oil immersion: Condenser, slide, cover slip, objective lenses all the same refractive index. This was a big invention of Ernst Abbe in the late 19th century. This condenser is really good and must have been fairly expensive when new. You could stick a stack of two cover slips onto the condenser top lens with immersion oil (or more permanently canada balsam, or LOCA) to adjust it to todays slides. The light source plays an important role and has to fit the condenser: Some condensers are more "short sighted" and work well with a lamp at the foot of the m.. Other condensers only acheive their n.a. when used with a mirror and a microscope lamp the emits a straight bundle of rays and stands something like 25cm away. A good starting point would be a fairly big light source, not a small spot like an LED or the filament of a clear bulb. Would a .7 NA condenser be a better fit for my situation? I'm thinking the one I have might be better for someone else who has the special need. Turns out the issue was the light bulb. I got a few different light bulbs and they worked much better. Still can't tell whether it's better with the lid screwed on the condenser or off. But it works both ways now that I got a new bulb in there. The condenser should support the objectives you use. In most cases the condenser is stopped down slightly below the aperture of the objective. If you have a 40:1 n.a. 0,65 objective you would use it with a condenser stopped down to ca. 0,5 to 0,65. When you remove an eyepiece and look into the tube you can see the back lens of the objective. When you open and close the aperture of the condenser you can see whether the light cone offered by the condenser fully fills the back lens. For children lower power objectives are easier to use and offer a more interesting view. So you high power microscope might better stay in the cupboard for a while and you start with the simpler microscope.